The main nutrient requirements for livestock are water, energy, protein, minerals and vitamins. In many cases, producers do a good job of providing enough water and adequate energy and protein sources. However, many producers fall short in providing the best nutritional program possible by purchasing “cheap” vitamin and mineral sources or failing to provide a vitamin and mineral source at all. 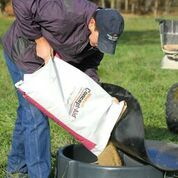 Mineral nutrition for the cow is important year-round, but is particularly important during late gestation, calving and re-breeding. Management of the maternal unit throughout gestation and lactation not only impacts her productivity, but the performance and efficiency of her calf as well. Why do animals need a good mineral program? All animals have a defined set of nutritional needs. When nutrients run out, that is where performance stops. Minerals are an important component of these nutritional needs, and there is a delicate balance that is needed for maximum biological efficiency to be realized. Selecting the correct mineral supplement is essential for maintaining healthy animals, optimal growth and improved reproduction efficiency. Nutritionally speaking, animals require two types of minerals: macro and trace minerals. How do I select the appropriate mineral program? Are all minerals created equal? Absolutely not. Minerals can come in organic and inorganic forms. Organic minerals are more bioavailable than inorganic minerals. This means that the more bioavailable a mineral is, the lower concentration that is needed to meet the animal’s requirements. How much does a good mineral program cost? A mineral program could cost anywhere from $20-40 per head annually, but feed additives included in some mineral mixes (i.e. Rumensin, Bovatec, Amaferm, etc.) can add $15-20, annually. Let’s say a good mineral program costs $30 per bag ($1,200 per ton). For some, that may seem expensive and some producers may be tempted to buy the cheapest mineral possible. Mathematically, however, purchasing the cheaper mineral program doesn’t always pay in the long run. At a 4-ounce per day intake, the mineral only costs $.15 per day. The cost per year would be $54.75. Let’s say the cows nutritional needs are not being met because she is consuming a “cheap” mineral source, and doesn’t conceive on her first time coming back in to heat. At $1.50 per pound, that is $79.95 per head you can miss out on or $25.20 MORE than the cost of a “good” mineral program for the entire year. Documented an increase in performance of 0.27 lb. day over non-supplemented cattle. Increased ADG of 0.16 (yr 1) and 0.26 (yr 2) lb. by steers given free-choice, non-medicated mineral compared to those with no supplement. Cows with high-level of inorganic trace minerals lost more weight than cows receiving organic trace minerals. Calves from cows on the high organic trace minerals saw higher ADG from birth to September. Pregnancy rate to AI was higher when cows were fed high levels of organic trace minerals. What role does BioZyme’s proprietary prebiotic Amaferm® play in a good mineral program? Amaferm is a natural feed additive used to improve the digestibility of feedstuffs and overall digestive health. Through increased feedstuff digestibility, more energy and microbial cell proteins are available to the animal for increased gain/body condition and feed efficiency to be achieved (Beck, 2012; Zerby et al., 2011; Caton et al., 1993). A healthy digestive system allows an animal to better utilize nutrients consumed, which translates into improved animal performance. Seventy percent of an animal’s immunity lies within its digestive system. Therefore, an animal with a healthy digestive system is more likely to perform to their genetic potential.